Sometimes, as much as we'd like to sit down and scrapbook for a bit, we draw a blank - aka "scrappers block". Not sure where to start? Try using a sketch to inspire your page layout. There are sketches for single pages, double page, 8.5 x 11 pages, mini pages, handmade cards and everything in between. You can even make up your own sketch if you are so inclined. I made this (very!) rough draft above of a page layout based on the Instagram photos I wanted to use. I'm sure I was inspired by a combination of layouts I see in magazines, online sites and in real life. I'll be turning this layout into a scrapbook page this week, but I'm not positive how much or little I'll actually use from this sketch. The important thing is that I got the creativity going! I'll post a link on the FotoBella Facebook page as soon as it's complete. Here are some great sources for scrapbook sketches and page maps. Pinterest. Did you know that Pinterest is now open to everyone and you no longer need a special invite to join? 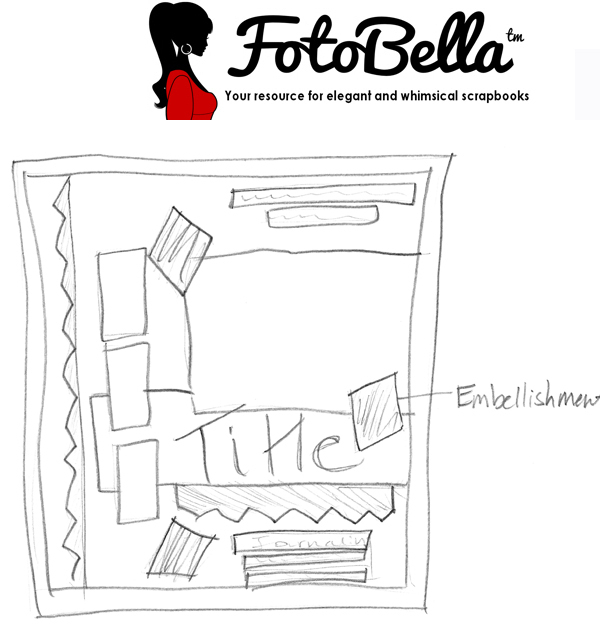 Take a quick look at the FotoBella Scrapbook Sketches Pinterest Board for some great links. Scrapbook Magazines. You will often find a column or feature in most scrapbook magazines that show how designers have used a sketch as inspiration for their layout. If you don't see this feature in a recent issues, you might want to check their online site, like this Creating Keepsakes article on Scrapbook Sketches or this Scrapbooks Etc. link to sketches. Search. You can also type in "Scrapbook Sketches" or something similar into your favorite search engine to come up with a plethora of great ideas. The best thing about using a sketch to plan your next scrapbook page layout is that not only can it be used in a variety of ways (mirror image, turned, adapted from one size to another, etc), but the same sketch can be used more than once and it will seem new each time because of the variety of scrapbook supplies, photos, sizes, etc. you'll be incorporating. You can use a sketch as literally or as loosely as you like! 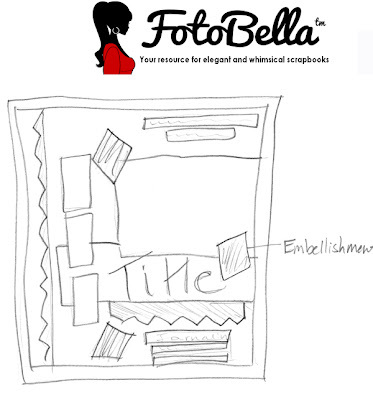 If you create a card or layout based on my sketch above, stop by the FotoBella Facebook page to upload a photo to share with our visitors.